my middle finger is the answer to everything. Lately i ‘ve been coming across all sorts of lists, to-do and how-to posts. Today i think i got at the end of my tether. OMG no.1 is make lists!!!!!!! Please tell me, IS IT ME, or needing to consult a list in order to be creative is just too much??? No.22 even says “Don’t force it” !!!! Then i came across a blog post “S.M.A.R.T. Goals; Organizing your goals (1, 5, and 10 year)”. (I am not posting the link because it is a sponsored post. Plus it pissed me of. Google it if you like). Repeating, 1-ONE, 5-FIVE, 10-TEN year goal organization. Quoting “Maintain a strong habit of running your life like a business”. Wow, that’s great! This way we can replace the “bite the dust” phrase with the “went bankrupt”! Once again, please tell me, IS IT ME??? Am i SERIOUSLY advised to organise my life in detail for the next TEN years in order to gain success and wealth? How about cutting the to-do lists and start living??? I’m a total NON list person…don’t even make them for grocery shopping because I have faith in my memory!!! So many people swear by writing everything down and then crossing off what they’ve accomplished but I find that whole thing wierder than wierd! I’ll be interested to read other’s comments about this topic! Reading this kind of lists can be fun and inspiring. But these days there are lists and to-dos about everything! How to be happy list, 15 things to do with your boyfriend, ect. I mean come ooon! If i you don’t know what to do with your boyfriend then you are obviously with the wrong man!!! Too much ‘over thinking’ these days, and not enough ‘just do it’. The list seems to be more appropriate for someone with writer’s block. Regardless of one’s situation, however, coffee is always a good idea. I know the list… and it actually worked the lists itself inspired me and gave me a few ideas on how to carry on. That’s good! These days i guess i just hate everything…. Just thought that you don’t need to stress to get out of them. I think they will pass by themselves. I didn’t get it! Then pun about blog-therapy i mean….! 😛 I can understand though, blogging is therapeutic… I don’t know about not stressing things, i guess you are right… i ‘ll eventually come to my normal self! Nice list. I feel soon good today because i have a lot of them in me. Feeling proud. Pretty nice list. What’s the meaning of starting quoted lines, in grey. Those words mean that i am quite pissed off with everything lately…. just having a few bad days…. Probably not the best place to share it but, I’m part of the annoying list makers. I HAVE to jot down ideas or they pack their bags and leave me the same day we meet. Not to mention I can not shop without a list. I keep different lists for different things a la Hermione style. My short term memory is not a star. However, I find planning the next 10 years ridiculous beyond words. I very roughly (and by that I mean there’s lots of strikes and arrows in my paper planner) plan my week only because otherwise I surrender to procrastination pretty easily. But you know, different things work for different people. I am certainly not against list. I am just cautious with lists that have to do with things that define us, like creativity. Each one of us finds inspiration in different places. The fact that we don’t search inside us but in lists is a tiny bit weird. Oh yes, creativity should be less about structure and more about letting go, I totally agree! Yes, although I believe ten years is too long. If you try ten years and you’re too far off the mark by the end of year five, you’ll get too discouraged. Determine where you want to be in five years. If you put some effort into it, it’s really not hard to do. Remember that most college students start off on a four-year lant but over half of them take longer — 5, 6, even 7 years to graduated. Once you determine where you want to be in five years, determine how to get there. What steps will you need to take? Break those steps down into annual goals, quarterly goals, monthly goals, weekly goals, daily goals, and, if necessary (you have children needing to get to school, for example), hourly goals. Now go do it! Because your hourly, daily, and weekly goals are pretty easy to accomplish, in five years you should be exactly where you want to be. If you get behind on a day, you can easily roll those missed daily goals into the next day, the next week, the next month……….. If you find yourself missing daily goals on a regular basis, then your planning is off. By doing that, you’ll be able to create a microenvironment and a microeconomy that you control. Nothing that happens around you will affect you significantly. I’ve been through the Great Texas Oil Bust of the early 1980s, the recent Great Recession, etc. Nothing has affect me because I work by the day and I know where I want to be in five years. I know people using this planning technique, and these days at work we are occupying with career planing. And it is generally supposed to be a very successful technique. I am just not that type o person, i believe that we put too much effort in thinking and planning about the future that we forget about the present. Plus i am in a phase where i reinvent myself. I am now finding out what i want to do. So maybe the fact that i haven’t always known what i wanna be when i grow up has to do with the fact that i dislike this life planning things. OK, so I will just say that I am a list maker. But honestly, that works for me otherwise all the to-do’s floating around in my head would drive me to your stress reduction kit. Lists help me focus and ultimately be more creative. 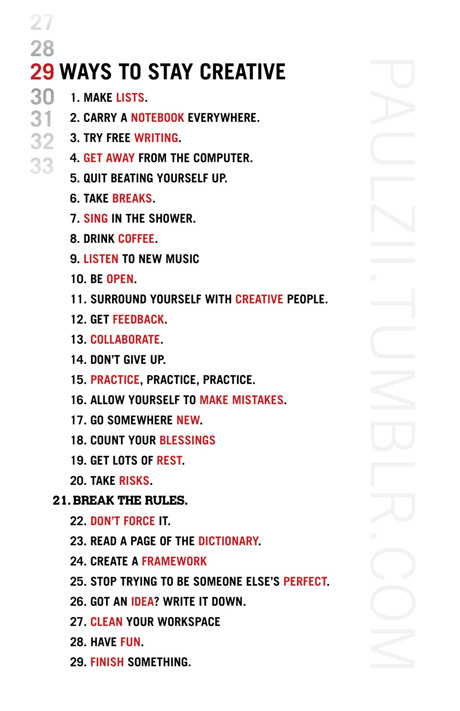 That said, #21 is break rules, which means toss this list if it isn’t working for you. Enjoyed this post, and thanks so much for becoming a Follower. Sometimes you get to read very inspiring stuff in lists, things you never have thought. But having people telling me to accurately plan my life for the next 10 years is just too much…. This a common discussion, and a major inter-personal debate. I don’t live my precariously. I can say that I live to the fullest. However, in terms of listing, I am a forgetful that I require to do that for best result. Sure, lists help me too! I am not proud of my memory! 😛 But i wouldn’t have a list define my life…. Hahahaha..I should have a shopping list for the shop in 10 minutes time…Or else I go bankrupt ;-)…list for 10 years…so which pile of papers did I leave it under…. No, I think it is actually alot of us – You have summed up exactly how my week was also! Miss Z makes lists and is very good at it but only crosses things out way too long after they should have been done in the first place; I hate lists because they give me the feeling I am being told what I should be doing, buying, achieving, etc. that I am not and really don’t need to – besides who has time to do all those things anyway and is there really a need to keep score of what has been checked off that nasty list? I usually only make lists when it is something that someone else in the house needs and I don’t want to suffer the repercussions of forgetting about it. Because it is not “mine” it may disappear in the chaos of my own mental “running list” and why aren’t they getting it themselves in the first place? Hahahaha you had me in stitches with this post! So I need to read a page of the dictionary to get creative hmmm… I’m all for personal development but when it comes to creativity it has to be off the cuff. hahaha! Ok, maybe i seem to be too harsh on lists, but thats not true….. lists show other people’s perspective on things and maybe inspiring but come oooooooooon, a list about how to be creative???? Creativity may hit me when i am depressed, “Get depressed” is not on the list!!! You should make a list and draw the outline of your middle finger on it 😉 … as well as post it to everyone who is advising to make lists! “Running your life like a business”, yeah I really hate those annoying closing times, when I actually have to leave work and go home…and free weekends without business! Ugh, I despise those the most! You are so right! Make the list cause you have to, cause that is the right thing to do, this is the way to achieve whatever you want to achieve. Well, it doesn’t work for me! hahaha! Come oooon, i make lists too! Do you have a list of the things you plan to do for the next 15 years?????? Lol. Thanks for the stress reduction kit Ioanna. I just used it! 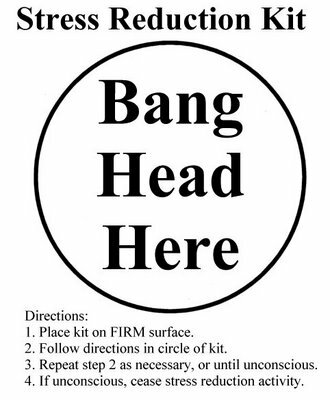 I need a Stress Reduction Kit…fast! Great to do list. It’s a perfect way to enjoy life. Coffee, music, travels with family, blogging…all these lights my day. This was truly inspiring and beautiful, please enjoy!